It’s a sad truth that some reporters want the celebs they interview to like them. Others don’t give a rat’s rear. But all I care about on this December morning in Studio City, California, is that Roseanne Barr doesn’t yell at me. Sure, she’s been perfectly civil to the press since ABC announced last spring it was reviving Roseanne, the classic “feminist working-class family sitcom” (her words) that made her famous. Still, the lady has a reputation. She’s crazy! She’s crabby! She’s crass! Even Barr admits that, over the show’s initial run (1988–97), she hired and fired at whim. She’s made people much more powerful than me (i.e., ABC execs) sweat spinal fluid. She rages on Twitter. Still, I love Roseanne. So getting shade from the star would sting. New characters are introduced alongside the familiar Conner faces. Why am I being so personal? Because Roseanne is personal, and it got personal, at a time when few comedies did. 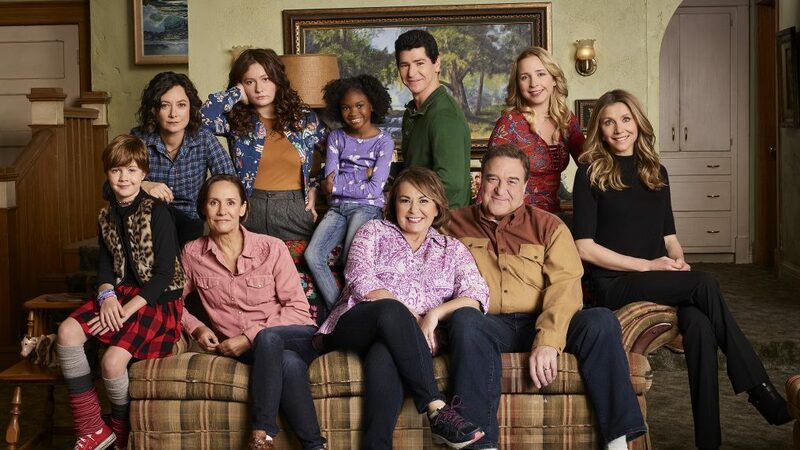 It was honest about the drudgeries faced by blue-collar Illinois high school sweethearts Dan (John Goodman) and Roseanne Conner (Barr), their children—popular blonde Becky (Lecy Goranson), sullen tomboy Darlene (Sara Gilbert) and cherub-faced D.J. (Michael Fishman)—and Roseanne’s single younger sister, Jackie (Laurie Metcalf). It embraced TV taboos that even dramas feared. But more often, fans cite different episodes that moved them. “I always get asked about the Season 2 episode ‘Brain-Dead Poets Society,’” Gilbert says. “People really responded to it, I think, because it’s when Darlene writes a poem publicly admitting she’s not a popular girl.” Then there are the episodes that hit embarrassingly close to home. “In middle school, my sisters bugged me for taking long showers,” says one fan (who asked to remain anonymous). “Then we were watching Roseanne as a family and D.J. was doing the same thing, because he was masturbating. I was mortified, but it was right!” See, personal. And groundbreaking. ABC dropped the first preview during the Oscars 2018. Barr had one stipulation: This time around, Gilbert, as an executive producer, would handle any disagreements with the network and writing staff. Comedian Whitney Cummings signed on as showrunner alongside previous Season 5 showrunner Bruce Helford. Another newbie on the writing staff: stand-up comic Wanda Sykes. Metcalf was starring on Broadway when she got the call and had to juggle filming with press for her Oscar-nominated role in Lady Bird. “I’d been hoping for a Conner reunion for 20 years,” says the actress. “I couldn’t wait to learn what Jackie was doing in 2018.” Turns out she’s a life coach (Jackie’s ever-changing job was a long-running joke in the first series). And remember that not-so-well-received addendum to the series finale in which Roseanne said the entire show was a story she wrote to deal with Dan’s death? Forget it. Now in their mid-sixties, Dan and Roseanne live in the same house in Lanford, Illinois. He’s a contractor. She’s an Uber driver. They’re still living paycheck to paycheck and struggling to afford medication on their pitiful insurance—Roseanne has become dependent on prescription painkillers for her bum knee. They’re also still devoted to each other. “If they weren’t a great team, there’d be no point in going on,” Goodman says. “Now they’re 20 years stronger. They deal with things through good humor and love. You have to adapt or you die.” Darlene is separated from husband David (The Big Bang Theory’s Johnny Galecki, who will return for one episode) and recently moved back home with her teen daughter, Harris (Emma Kenney), and 9-year-old son, Mark (Ames McNamara). Mark likes to dress in girls’ clothes—something Dan and Roseanne accept but fear the rest of Lanford won’t. The outspoken star had much to say about politics and how the show reflects them in the new season. Becky, meanwhile, is a widow (Glenn Quinn, who played her husband, Mark, died in 2002) working as a waitress at a Mexican restaurant. “I’m proud of old Becky,” Goranson says. “She’s holding a job, but she’s been coasting through life shut down because of her grief. Then she has this epiphany.” She decides to be a surrogate for a rich woman, played by Scrubs’ Sarah Chalke (lovingly known as “Second Becky” for replacing Goranson on-and-off during the 1990s). Also back: Sandra Bernhard as Roseanne’s gay friend Nancy; Estelle Parsons as Jackie and Roseanne’s mom; and Natalie West as the sisters’ flighty bestie, Crystal. And, yes, Roseanne voted for Trump—as a result, she and Hillary supporter Jackie haven’t spoken for a year. “We wanted to reflect our country now and how even families are divided, people have flaws, they’re opinionated and they can be both right and wrong,” Barr says. “But we make it funny.” And then, out of the blue, she compliments my shoes.